Drones and Photogrammetry What you need to know! > Drones and Photogrammetry What you need to know! Photogrammetry allows us to determine the position of points in physical space starting from the positions of the corresponding points on photographic images. It is often the preferred method for terrestrial data acquisition as it is the most reliable, accurate, and cost effective. Technological development of recent years and the consequent spread of suitable equipment acquisition and data processing has multiplied the uses in various fields, such as architecture, engineering, geology, archaeology, cinematography and also for the detection of underground oil. The explosion of the unmanned aircraft market, more commonly known as drones, has made an instrument suited to major works of aerial photogrammetry available to everyone. A photogrammetric flight consists of a sequence of rectilinear paths positioned side by side. We are showing a flight mission conducted with a DJI Phantom and a mission planning app (such as Pix4D Capture). The flight technique is called “Overview”, performed at low altitude, allowing the vision of the landscape at a “bird’s eye”. Due to the low altitude, the vision is perspective and it is not possible to evaluate the distance between objects at different distances and it is necessary to resort to software for the data processing. When planning a mission, you must consider the speed of the aircraft, the frequency of shots and shorter exposure times, along with a particular attention to the presence of any obstacles present in the area to be flown over, and to avoid positions of back-lighting. The images taken in swiping must have one part in common of the territory for at least 60%, consequently each image will have bands that represent portions of territory in common with the adjacent images. This parameter is called overlap. In this way it is possible to identify points of belonging to more images and use them as points of concatenation of the images, or even as supporting points for the processing of three-dimensional models. The equipment of one or more GPS receivers enables you to detect the spatial position and the asset of the camera at the time of image capture with some margin of error and speeds up data processing. 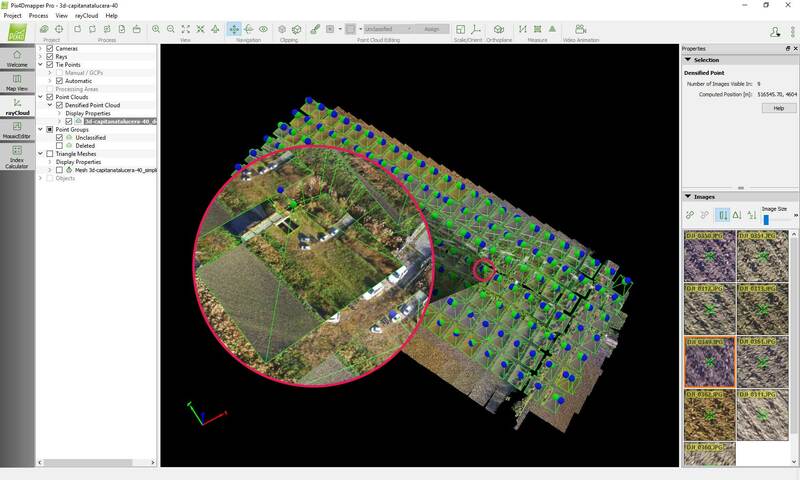 In our case, from data acquisition you can see the swipes of pictures, processed with Pix4Dmapper for the creation of a 3D model. The software automatically snaps pictures and also automatically reduces errors from the drone internal GPS. In the picture, the blue dots indicate the positions detected by the GPS and the green ones the correct positions. 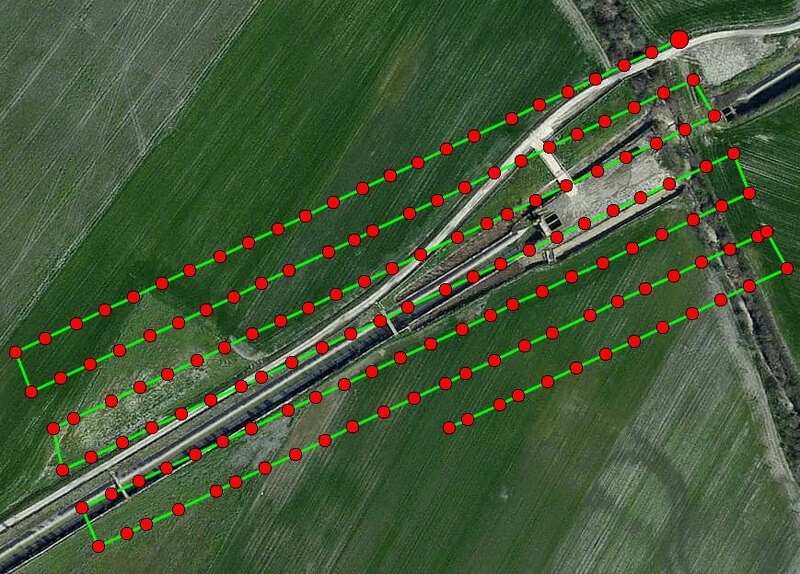 Although medium size scales, which can be for example those of a field used for agriculture these error margins are acceptable abundantly, to further reduce the error it is enough to simply increase overlap. 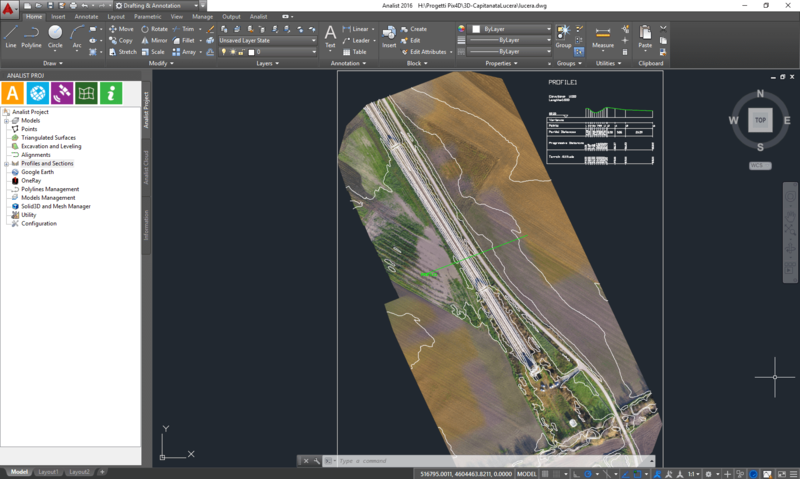 To perform topographic operations just import a 3D model generated from Pix4Dmapper into Analist 2018 CLOUD. 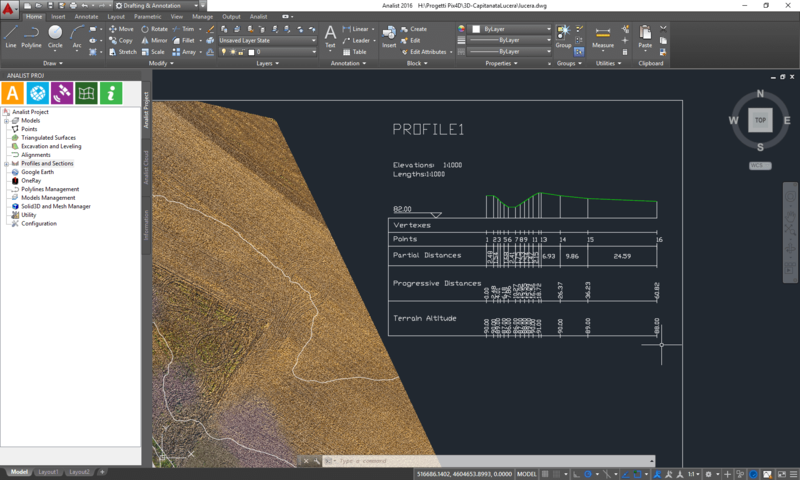 Then with a few simple steps you can generate contour lines, sections, calculate volumes and more.